Suspect steals motorcycle during Foursquare Sunday service - BlogIT with OLIVIA!!! The congregation at the Foursquare Gospel Church, Magboro, Ogun State, were stunned on Sunday after a suspected thief sneaked into the church and stole a motorcycle belonging to one of the worshippers. But for the alertness of security guards on the church premises, the suspect would have escaped with the motorcycle. 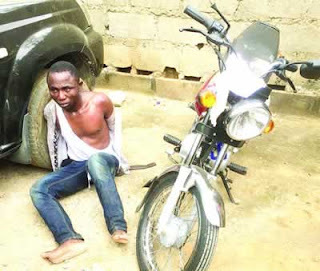 The guards were said to have mobilised some other motorcycle riders in the church, who gave the suspect a chase and arrested him as he was about riding onto the Lagos-Ibadan Expressway. Upon his arrest, the suspect, who identified himself as Raymon and later Ramoni, said he took to robbery because he was hungry. Policemen from the Ibafo division were later invited to take him away. A member of the church, Ogungbola Adenekan, said the incident happened around 1pm while the men’s fellowship was on. He said, “The service was about rounding off when some ushers who knew the owner of the motorcycle came into the church. They asked the man if he gave anybody permission to take his motorcycle away and he said no. “We immediately asked some of our brethren with motorcycles to chase the suspect. Some commercial motorcyclists also joined them. He was about to ride the motocycle onto the expressway when he was caught by the members who went after him. They brought him back to the church. The suspect, who reportedly gave conflicting information about himself, allegedly claimed to be from the Mowe/Ibafo area of Ogun State. He reportedly identified himself as Raymon, Ramoni, among other fictitious names he gave, saying he was a barber and it was his first time of committing a crime. Another member of the church, Sam Adebowale, said the suspect could have been lynched, but for the intervention of the church leadership. He said, “The motorcyclists in the area were angry that while they were working hard, somebody had the boldness to steal. They had started flogging him and wanted to lynch him, but we stopped them. Adebowale, who claimed that such a thing had never happened in the church, said the church would increase security in and around its premises.